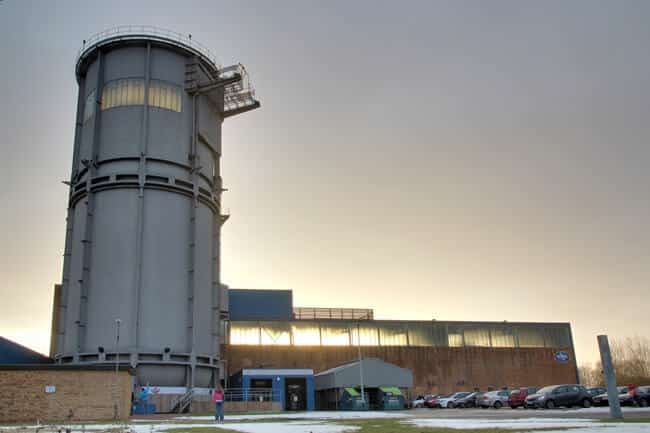 The wind tunnel at Twinwoods Adventure (formerly Bodyflight Bedford) is a unique 16 ft recirculating wind tunnel. The tunnel is a one of a kind project which has been refurbished from an old wind tunnel on the site of an old science research facility. The location also includes indoor surfing, racing simulators, a spa, climbing wall, archery, shooting and a hotel. We attended last week during half term ,it wasn't that busy to be honest not that we noticed as there was so much going on ,from signing in to fitting our jumpsuits,then on to a quick tuition with our instructor who may I add was a barrel of laughs an with it being all of our first flights he really made us at ease an put up with our nerves an was very patient. You get a chance to have a 2 minute toilet break after tuition then once earbuds ,Goggles an helmets are checked you walk into a tunnel leading through to main waiting area on ur right an flight area on ur left,the family an friends watching are aloud to take photos but you are not aloud any devices in the main flight area,there are lockers for your possessions which are a refundable £1..we brought the memory stick for £5 an although it does have ppl from our group on it that we don't know I highly recommend buying it as you will have a barrell of laughs watching yourselves back from the side view as well as top! There are photos available to buy which we did spend a small fortune to then find out you can go on FB and share your experience photos like you do at theme parks with no code needed. Toilet's just outside flight area was clean an basic but downstairs in restaurant area the toilets where either blocked X3 or had no toilet paper an where not clean but that didn't dampen our day ..we did choose to eat in the restaurants after our flight an the food was very nice but a bit over priced for what you actually got . .no desserts served although kids found the ice lollys soon enough! After which we ventured down to the playhouse which was surprisingly small we was expecting alot bigger again over priced at £6 a child an £1per adult it's too much for what's there but the actual space was clean ,bright, inviting although the staff in the flight area where amazing the staff at soft play where cold,quite rude,got the knock an huffed an puffed when we was deciding if we was going in even though we was only ones there ,it's not like there was a queue but the young lady seem eager to get back to her chat with her even younger colleague but over all it was a memory we will never forget an are eager to repeat..out of 7 of us 6 wants to return! We attended for my father-in-laws 60th birthday and whilst in the viewing gallery, my little 2-year-old daughter asked when it was her turn. Jokingly, we said to the instructor that she wanted to have a go. Next thing we knew, he arrived in the viewing gallery, passed a suit, helmet and goggles to us, told us to get her dressed and off she went! The look of sheer excitement on her face when she came out of the tunnel was priceless. And to top it off, we were told that the flight was on the instructor!!! So both my father-in-law and my daughter thoroughly enjoyed the experience. We are now planning to go back in the near future so I can have a go too! But I'm so glad she did! 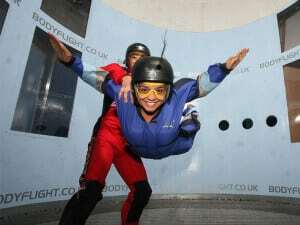 A great family day out, and the Skydiving experience was brilliant! Tho I won't be in a rush to do the real thing just yet! The Team at Twinwoods Adventure are brilliant! Friendly & Polite. The skydiving instructors were brilliant. Our instructor reinsured my daughter (who was about to back out of the skydiving) to give it a go. And if she didn't like it & wanted to come out, he would bring he out no problem. She gave it a go twice & that has really helped her confidence & like us she is very proud of herself, thanks to the instructor (Jay I think! The blond guy! lol). He also looked after my special need son with great, great care. Which he absolutely loved! I can't fault the place or the Team. Thanks again to Twinwoods for such a great experience & I've recommended to many now, and some are ready to book very soon! Thanks again.